Has it ever happened to you to feel that you bite is high after leaving your dentist’s office? It may feel something like having a filling that does not feel just right, and it feels like your teeth don’t come together. In dental terminology we refer to bite as “occlusion”. Occlusion is basically the study of “bite” or teeth contacts both in static (without jaw movements) as well as dynamic (during chewing) situations. Occlusion is a pretty dry and complicated subject in dentistry that everyone runs away from it. It requires lots of knowledge, skills and the right tools to adjust someone’s bite and equilibrate to ideal. I am afraid to say that Occlusion is not thought in depth at dental schools to general practitioners. Even though many dentists learn about it after dental school through different courses, it is not uncommon to see cases that have been mis-diagnosed and mistreated. This is an example of a recently fabricated crown that was cemented about a year and half ago and it came off twice. Crown was high and was not adjusted properly. 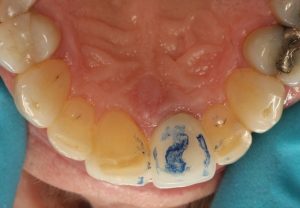 which is shown by being the only tooth marked in blue, meaning the rest of the teeth do not touch at all. The blue dot is supposed to be visible on all the front teeth ( as a sign that they are all touching the opposing teeth) but only the single New Crown is marked blue, as you can see on this photo. This means when she bites and when she moves her lower jaw during the normal chewing movements, the new crown is the only one that is contacting the opposing tooth in the lower arch. That is too bad bad! Patient did not complaint and thought she will get used to it. But she never did, instead the new crown was coming off as the result of being under excessive pressure during chewing. 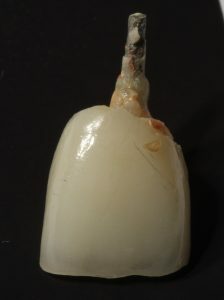 The dentist re-glued it twice and when it happened for the 3rd time, he recommended to have the tooth extracted, because he thought the reason for the crown coming off was “tooth fracture”. Post broke inside the tooth, and the whole crown came off. Now the tooth needs to be extracted. Beside knowledge and skills, meticulous attention to details matters and it can make a big difference in the treatment outcome and longevity of the restoration. Prosthodontists are masters in restoring your teeth and adjusting your bite. If you bite is not right, find a prosthodontits near you and find out how he/she can help you.